After a tragic incident with a student, Nate, a professor at a small New England college, retires from teaching and from life. He ends his self-imposed exile with a tour-group trip to Venice in the company of his overbearing, mostly estranged brother. Nate is unsure he’s equipped for the challenges of human contact, especially the fraternal kind. He tries to play along, keep up, mixing his antidepressants with expensive Chianti, but while navigating the labyrinthine streets of the ancient, sinking city, the past greets him around every corner, even in his dreams: There’s the stricken face of the young woman whose life he may have ruined, and there’s Julian, the older brother who has always derided and discounted him. Is Nate sunk? Is the trip, the chance to fall in love — in fact, his whole existence — merely water under the ponte? This is only the second thing by Russo that I’ve read. I recently also read (and thoroughly enjoyed) Straight Man, which I hope to review at some point in the near future. I have also acquired his Pulitzer-prize-winning Empire Falls, which is very high on my TBR mountain. When this popped up on Amazon UK’s Kindle Singles page, I thought it would be a great, quick read to fill in a gap between full-length novels. I was not wrong. The story follows Nate, who has come on this trip with his estranged brother. He is getting on in years, and has fled a strange event related to a student back home. As he tries to figure out why his brother is giving him such a hard time, while also considering his fellow travellers, we get to know what happened to him back home. As it turns out, it’s probably not what you were thinking. I thought it was a real good change from the norm, too. Interesting characters, a quick, engaging plot. What more can one want from a short story? This is, overall, a really well-written bit of fiction, very much focused on the characters. What drew me to the story was not just because I enjoyed Russo’s novel – although, they do share some elements. I am really drawn to fiction set in or connected with universities. In this case, the protagonist is a professor, and as such the story contains some interesting (and familiar to me) commentary on universities and teaching. For no other reason than they interested me, and because I’ve experienced similar things as both a student and teaching assistant, here are a couple of examples. And the frustrating reality of students not realising that clarity is oh-so-very-important. Anyway, back to the review. This is a short, well-written and well-constructed short story. 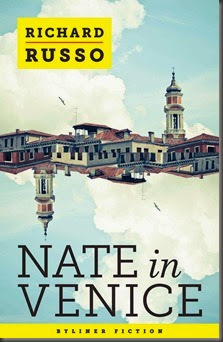 Nate in Venice is a great introduction to Russo’s writing and style, and was a very enjoyable read. Very much recommended.